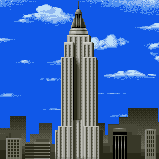 Luigi's photograph of the Empire State Building, taken during the events of Mario is Missing! The Empire State Building is a skyscraper in New York City, and at the time of its completion was the tallest building in the world. The Mario Bros. both independently from each other visited the building. Also, in some point of history, it was home to Dr. Light, and possibly Link as well. The Empire State Building is known to be the setting of the popular film King Kong's finale, where a giant ape called King Kong climbs up the skyscraper to flee from its attackers. In both Mario franchise appearances, allusions to this film were made. First, on his journey to New York City in Mario is Missing!, just like in any other city appearing in this game Luigi had to return artifacts that were stolen by Koopa Troopas to their respective landmarks. From the Empire State Building, the Troopas stole King Kong. Upon delivering the ape back to the skyscraper, Luigi was rewarded a prize of 1,960 dollars. The building later appeared in the Club Nintendo comic "Mario in Mariozilla". In this story, Kamek accidentally makes Mario grow to approximately 120 meters. Searching for a solution to this problem, Mario calls on Dr. Light for advice. Because Light lives in the top floor of the Empire State Building and Mario obviously does not fit into the elevator, he decides to climb the building up, just like King Kong in the movie. On his way up the building, some Japanese tourists in a helicopter take photos of him, but when he sneezes, the helicopter crashes. 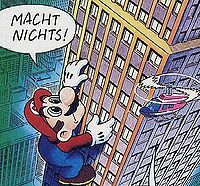 Mario also damages the pane of the top floor, as he wants to talk to Dr. Light. Link can also be seen in Dr. Light's room, studying a map with the doctor. Named after New York's nickname, the Empire State Building stands 1453 feet tall. At 102 stories, it's the third tallest building in the world, and is served by 73 elevators. It would take 30 minutes to climb the 1860 stairs, but the express elevator will carry you to the 80th floor in under a minute. While King Kong is a fictional figure, the resident window washer can be seen daily, climbing the portable scaffolds which enable her to move easily around the five acres of windows. Each pane gets washed once a month. This page was last edited on April 10, 2019, at 19:27.